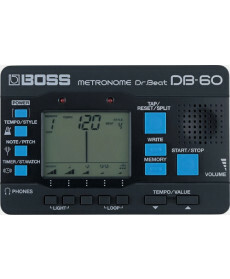 Metrónomo Digital Boss DB-60 Dr. Beat. 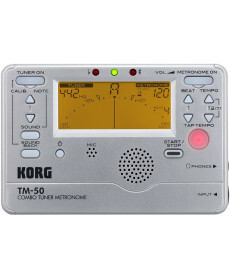 For practicing a particular song, it’s important to set the metronome to match the feel of the song, so along with the basic metronome functions, the DB-60 offers a variety of rhythm patterns such as 8-beat grooves, waltz, bossa nova, and more. 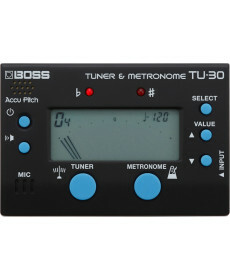 Afinador Cromático com Metrónomo Boss TU-30. Cor: Silver. 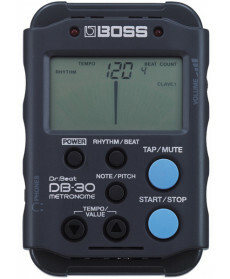 Metrónomo Digital Boss DB-30 Dr. Beat. Material: 1x Entrada (Input - Jack 1/4''); 1x Saída (Phones - miniJack). 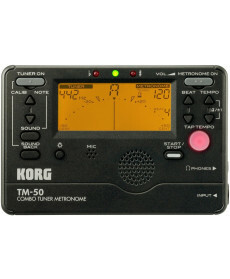 Electrónica: Tempo: 30-250 (Precisão: ±0.1%); BEAT: 24 tipos; Reference Pitch: A4=438 Hz-445 Hz; Reference Tone Range: C4 a B4. Alimentação: 455. Comprimento: 6,1 cm. 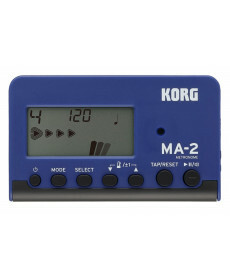 Altura: 2 cm. Cor: Blue-Black.